Ever since I was a kid I have enjoyed the whole chakuli making process. Thanks to my big family, making chakulis just before chauthi (the Ganesh festival) and on the day of chauthi was always fun! All the ladies of the house, my mom, my grannies, my aunts, the kids :-) all got together to make crispy, crunchy delish chakulis. It was a real team effort. And we had to make a whole lot of chakulis, since we had to make enough chakulis for our big fat family and our relatives (relatives of every single person of our family :-) so that’s n*n). 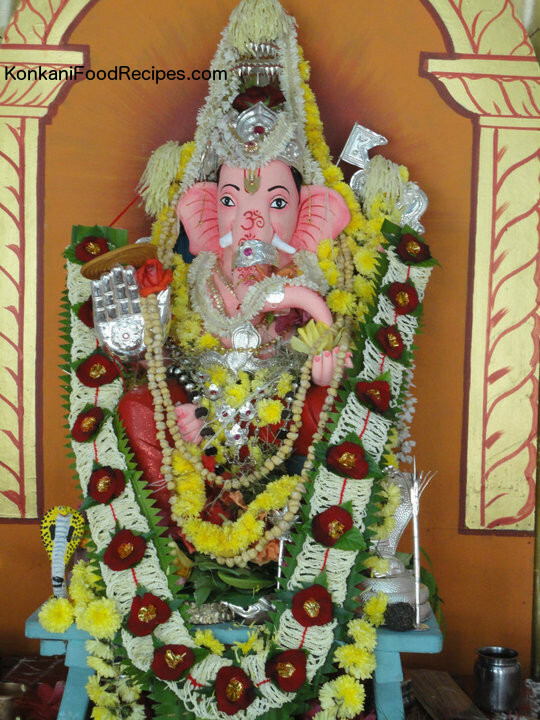 Plus it’s a custom to give chakulis to all our relatives since we worshipped the Lord Ganesha idol in our house for two days during the Ganesh festival. 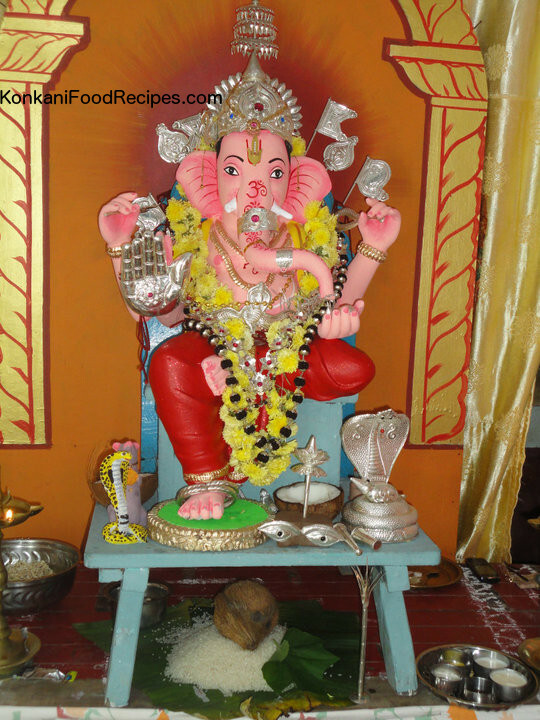 Chakulis are believed to be Lord Ganesh’s favourite food along with laddoos. Hence, it’s mandatory to make them for his festival. While my mom and aunts get busy sweating it out in the kitchen, during the chakuli making process, we kids got busy eating chakulis one after the other. :-) The family elders too walk in one by one and the chakulis made, disappear in seconds. As we grew older we started helping with the chakuli pressing process as the job can be tedious when you have to make a whole lot of chakulis. I also loved eating the chakuli dough. It tastes amazing. You can press the dough into chakuli and then eat them in layers. That tastes even more amazing! :-) So, my mom or aunties had to shoo me away for emptying the chakulis as their efforts go in vain when I eat the pressed chakulis. 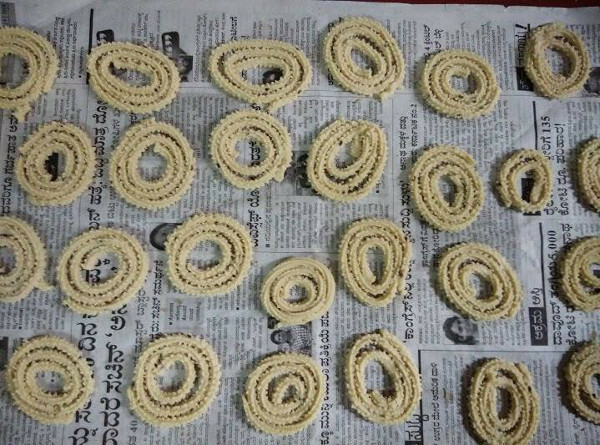 :-) We would make a fresh batch of chakulis exclusively for Ganesha on his day of arrival, as naivedyam. (If made earlier one of us would accidentally eat them. Only after naivedyam could we eat them. Our moms actually hid it in secret places to preserve its sanctity.) Ahhh memories!!! There are several ways you can make great tasting chakulis. Here’s a simple recipe for making crispy, crunchy chakulis. Heat store bought urad dal in a wok until it starts to brown a little. Saute for uniform roasting. Once it cools completely, powder it in a blender into a fine powder. Sieve the powder so that any remaining bigger pieces of urad dal is left behind and you get only fine urad dal powder. Heat store bought rice flour in a wok, until its hot when you touch it with your fingers. Then let it cool completely. If you don’t find rice flour them make rice flour at home. In a bowl mix well rice flour, urad dal powder. To them add salt, turmeric and mix well. To the mixture add sesame seeds/ajwain seeds and mix well. To the mixture add butter, water little by little and knead it into a dry, palatable dough like that of chapathi dough. Heat oil for deep frying the chakulis. Set it on low heat. Add 3 tablespoons of hot oil to the dough and mix well. If your dough is watery, adjust it by adding heated rice flour little by little. 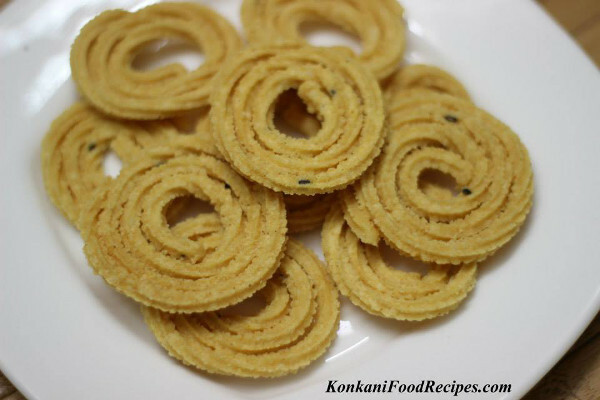 Transfer the dough into a chakuli presser and make chakulis like in the image below. Set the oil to medium heat and fry the chakulis in batches until they are golden brown in colour. Do not over crowd your oil. Transfer the chakulis onto a tissue paper so that all the excess oil drains off. Transfer the chakulis once they cool into a air tight container and store them. 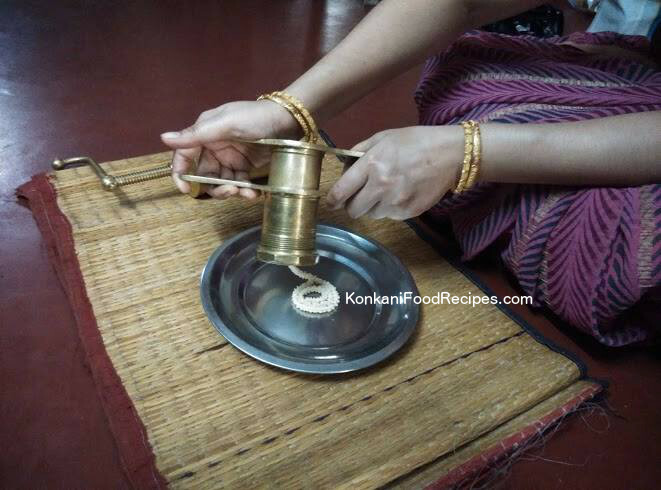 Make chakulis using the plates which come along with the presser, for thickness of your choice. I use a muruku, sev maker like this one. It's sturdy and has been around in the house for more than 20 years. It's also easy to use. This on the other hand is cheaper and is made of steel. You can even make rice noodles (shevai, sheviya, idiyappam) using the above mentioned press.